Free San Francisco? Well, it's an expensive city but there are plenty of free things to do and free attractions (if you know the right days to turn up). In fact author Daniel Davidson has found 101 of them, included in the San Francisco guide in his admirable series of Travel Free eGuidebooks. You can see from the Table of Contents what's covered in the guide. We'll also show a screenshot of the first page of Chapter 1, the Free Museums and Galleries. It doesn't show the museums and galleries covered in that chapter, but does show you how helpful the book is. The reference to 'over 200 museums in San Francisco' takes you to a Wikipedia page listing all of San Francisco's museums, which has photos and, in turn, links to Wikipedia's entries on each museum, with of course links from there to the museum websites. The page also shows one example of the bonus material included in the guide - free attractions that the author found in the wider Bay Area that were too far away to include in the main part of the book. So What's Free in San Francisco? If the book merely listed obvious free attractions like parks and markets, there wouldn't be much special about it. It's still useful to have them, but as a reader I'd expect more than that. And the book delivers. Who would have thought you could get free food and drink in an expensive city like San Francisco? And I don't mean the Soup Kitchen. The author tells you where you can get a free pizza and free beer (yes, really), a free sake tasting, free chocolate, and even free oysters. The book also lists some free walking tours, and other tours where children go free. There's a separate chapter on free activities for kids, too. But what's most impressive about the book is the generous way the author shares what he's found. There are links to organizations that can help, phone numbers, information about magazines, and loads of other extras like a link to a Google map where the author has pinpointed all the kids' playgrounds in the city, and another link to a web page listing 44 kid-friendly parks in Marin County. It is a little cheeky to include Alcatraz as a free attraction. Technically it is, as there's no charge to get onto the island. You do have to pay for the ferry there and back, though! To be truly free you'd have to swim both ways. But I suppose if you're going to list the attractions with free admission, you can't not include this major San Francisco landmark. I did find one or two little technical errors, which I hope the author corrects. In my version, although there is a Table of Contents at the front of the book, I was unable to click on 'Table of Contents' on my 'Go to' menu to take me back there. And in that Table of Contents, when I click on item 2, Interactive Map, I'm taken not to the map but to the very end of the book. The Interactive Map is there, and what a bonus it is for an ebook compared to a printed guidebook. If you have an internet connection you can access it online, and it lists all 101 of the free things to do in San Francisco. If you're staying in or near San Francisco you can use the map to get your driving directions. You also get the address, phone number, a link to the website if there is one, the chance to search nearby for other attractions in the area, and read other people's reviews of the place. One other feature is that it shows you when the map entry was last updated. I was very impressed to see that although the book first came out at least 12 months ago, the map was last updated just over three weeks ago as I write this review. It's always useful to check out the Amazon reviews for Kindle travel guides, as there are some real rip-off titles out there - sometimes just a few pages in badly-written English. Fortunately this isn't one of them, and it has mostly 4-star and 5-star reviews. I can't believe the only 1-star review it has, which says the book only has the same free tips that are available in any city. What? Did we read the same book? Can you get a free sail-boat ride in San Francisco Bay in any city? Or free urban bicycling workshops? Or get a free sake tasting? I don't think so. 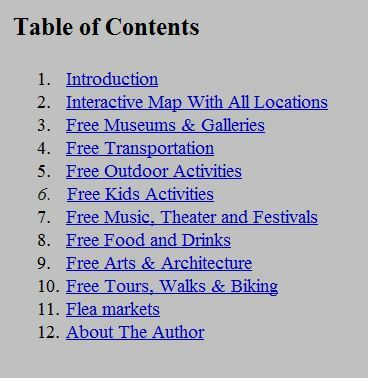 I'm not going to spoil the fun but I love the author's listing for the 101st free thing to do in San Francisco. It's highly appropriate. We really do recommend this book highly, if you're planning to visit San Francisco. Even if you're not too bothered whether something is free or not, the author has still unearthed lots of fun things to do in the city. The guide will work best if you have a good internet connection, but even if you're using a standard Kindle with poor connectivity, it's still worth it. 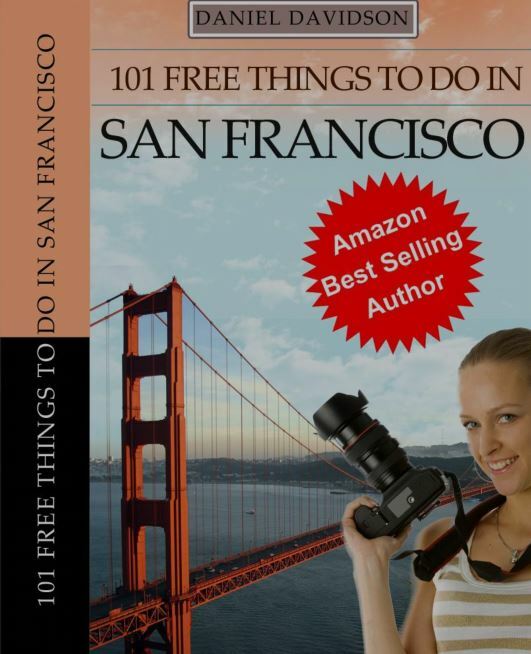 101 Free Things to Do in San Francisco is available for the Kindle at Amazon in the USA, Amazon in the UK, And at other Amazon stores worldwide. If you're going to be spending any time in San Francisco then we really recommend doing what we did, and getting a San Francisco CityPASS. Not only does it get you into some of the top attractions like the California Academy of Sciences and the Aquarium of the Bay, it also includes a 7-day Cable Car and Muni Bus Passport and a free cruise in San Francisco Bay. We definitely got full use of ours!